“The distribution of Dawn newspaper, for the past month, is witnessing daily disruptions in targeted cities and towns across Pakistan. Hawkers and sales agents are being subjected to continued harassment, threats and physical coercion, while attempting to deliver copies of Dawn to our regular subscribers,” says a statement issued by the management of Dawn on Tuesday. “Newspaper vans and hawkers, distributing copies of Dawn, have already been denied entry to many cantonment areas for the past several months. Since the middle of May, however, officials posted in several cities and towns in Sindh, Punjab and Balochistan are disallowing the distribution of Dawn to even civilians residing in several areas. Multiple reports are also coming in of officials posted in many cities and towns in Punjab, arbitrarily summoning newspaper agents, hawkers and salesmen, and warning them not to distribute copies of Dawn, threatening them with consequences if disobeyed,” the statement says. The management has appealed to Dawn’s longstanding readers to demonstrate patience and tolerance with respect to these temporary disruptions, and wherever possible, contact their sales agent or the newspaper’s office directly to report either intermittent delivery or non-delivery of Dawn. It has been more than 8 months I can't have Dawn News paper here in Thull, rural Sindh. I have to either buy a one day old news paper from another city (35km away) or read through this application. It is unjust. I am from Larkana and DAWN is banned in entire District. Am Dawn reader for more than 25 years. This news made me sad. This situation should end immediately. Why CJP is not taking notice. 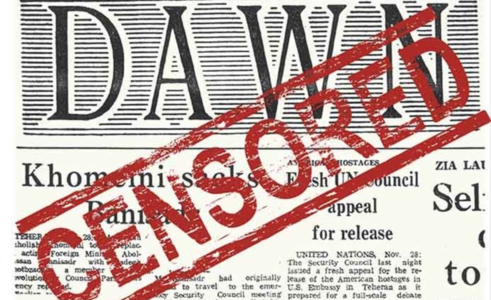 Dawn is the only newspaper and media company that does objective and neutral reporting and establishment does not like it and therefore imposing restrictions. What a joke. I guess Dawn printed the truth. And establishment does not like that. it's a silence dictator ship. You can quite one but you cannot quite their ideology by dirty tricks. PPP is very influvencial Sind pariticularlly in Larkana area.e. It is a very sad and disturbing news. This is matter that deserves urgent attention of the Chief Justice Of Pakistan with prosecution and exemplary punishments to those who are obstructing freedom of press and causing inconvenience to the readers of this highly esteemed newspaper that has been in exemplary service for so many decades. This is bad. Authorities must stop this practice and stop hiding the truth from public. Who is doing all this ? It is sad to see that media houses are being exploited financially to bow down. I think Dawn should seek IT based alternative modern ways to reach out to maximum readers and earning money through internet based services. Most of western media companies are going paperless and expanding their digital resources. No wonder, I'm not getting my copy from Sunday onwards. So sad the newspaper which is one of the oldest newspaper is facing this kind of situation. dawn never give up this time will pass. Establishment likely behind this move. Dawn is the only reliable source of news in Pakistan. I am proud to be a DAWN reader; its like my own paper! I salute Dawn ...Truth shall prevail as has always been...! My access to read on line was even blocked back week... What are they afraid of...Shame ...! Who says the Establishment is not scared of the Civilians? Fourth pillar of democracy is doing a wonderful job and now it is up to the citizens of Pakistan to go out and not only buy the paper but as a token of solidarity with the Dawn as well as with fourth pillar in general, carry newspaper in their hands and take pictures of Dawn Editorial and send to friends and relatives through social media. With the caption- I stand for freedom of Fourth Estate. I am an Indian & admirer of Dawn.I read the newspaper on internet.Can anybody in Pakistan enlighten me why the authorities are obstructing its distribution in Pakistan. so free circulation allowed for daily ummat like papers but not Dawn. why our policy makers are so afraid of truth? If it is real, has Dawn analysed why it is so? Seriously. Once upon a time this also happened to The Indian Express, a prominent Indian daily during the days of Smt. Gandhi. Similar situation is taking place to The dawn in Pakistan . Freedom of speech or freedom of expression is basic essence of democracy. I am of the firm belief that the voice of dissent is also a basic part of democracy. Democracy can not be subverted by authoritarian rule in any part of the world. The ruling establishment must realize this fact. In any way I am with the dawn. Dawn, we appreciate your services to defend Pakistan against the forces of Corruption and Plunder. Whole nation is behind you. Dawn-pls end a donation/funding page to your website. I think the expat community in particular would be very keen to support you financially to ensure you continue to air the truth and overcome any losses with loss of readership due to these tactics. I buy two newspapers everyday. One of them capitulated under immense pressure some weeks ago, as it couldn't pay salaries to its staff. Dawn has withstood the pressure. Hats off to the management of the great paper, which the father of the nation used to read. CJP would never take a suo moto on this issue. No surprise there I guess. It is the cost of saying truth.